Why Are Goals So Hard? I set goals all the time – daily, weekly, monthly, yearly and ongoing goals influence me every day. Sometimes these goals are easy. Take the trash out? Check! Do dishes? Done! But some goals are incredibly difficult to accomplish, like my forever goal of adopting a more healthy lifestyle. Why is that? I think one of the big reasons why these long-term goals are so tricky is because we don’t see any kind of immediate reward. You can exercise and diet for months without seeing any effect on your body, and it’s disheartening. So I decided to come at goal setting a different way – by setting goals and rewards! Essentially, all I need to do is set a specific, measurable goal and determine a positive consequence of hitting that goal. And – here’s the vital part – I need to make good on these promises and actually reward myself. These goals have to be challenging, but still attainable. The idea is to push myself to do better at the task at hand. For example, I want to drink less soda. Therefore, I have set a goal of drinking zero soda for 10 days straight. My reward for this behavior is that I can add $5 to a fund just for clothes shopping. The better I do, the more money I have for new clothes. It’s that easy! Then I signed and dated the contract below. This little gesture adds gravity to my goal setting. Try it and you’ll know exactly what I mean. It feels more real and more powerful when it’s written so plainly, and signed no less. 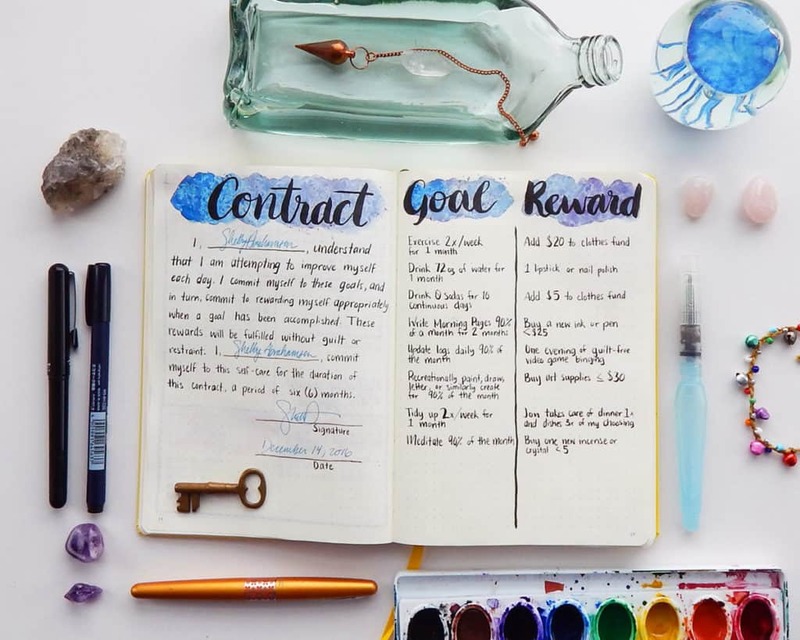 Write this before you get into the nitty-gritty of your goals and rewards and you will take the process much more seriously – which you definitely want! It’s also important to take some time to decorate your goals and rewards spread. Make it look special because it should be special. Demonstrate your commitment in some way, whether it’s as simple as slowing down so your handwriting is neat or embellishing it like I did. I used watercolors (which I talk about in-depth here) and my Pentel Pocket Brush Pen for the headers. For the main body of writing, I used a new pen of mine that I absolutely LOVE – the Tombow Fudenosuke hard tip pen. Then I signed my name with a Pilot Metropolitan fountain pen, naturally. 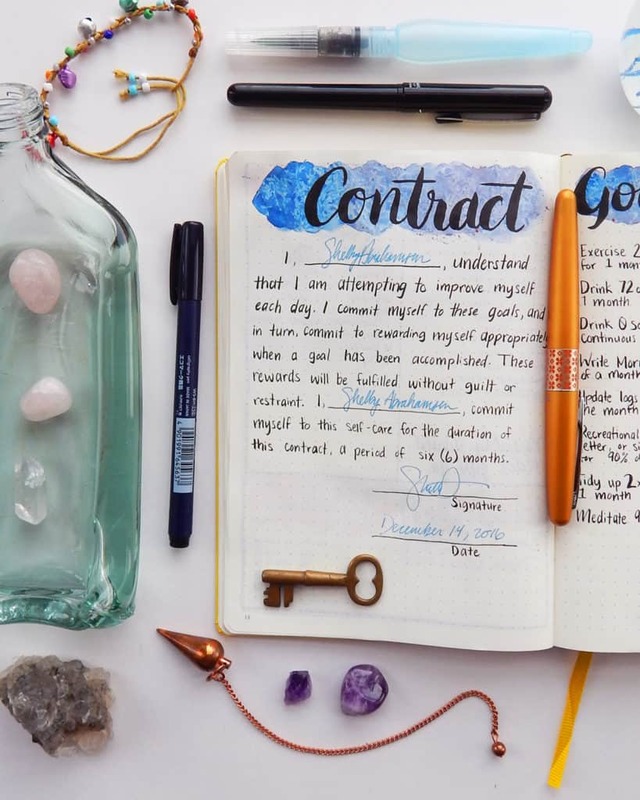 Because nothing feels fancier than signing a document with a fountain pen! Oh, and the ink was Noodler’s 54th Massachusetts, if you were curious. Setting effective goals can be tricky, but it can definitely be done. 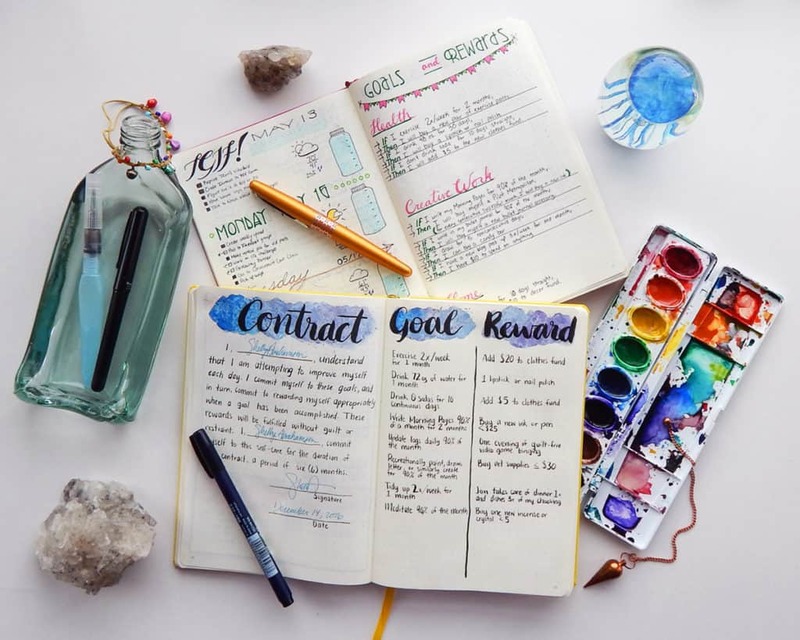 Knowing how to set goals that are both within your reach and still challenging is a tough balance to find, but once done, it can drastically change your progress. Great goal setting can mean the difference between frustration and exhilaration. To start, I sit down and come up with all the general goals I’d like to set for myself. Work out more, drink more water, draw more, etc… Then I think long and hard about how I’m going to assess the goal. I settle for something that I think I can do if I tried, but only if I try fairly hard. For example, I have a goal to draw, paint, practice hand lettering, or do some other creative task for 90% of the month (which is allowing for 3 off days). I can track my progress in my habit tracker and figure out at the end of the month whether I was successful or not. After I have all my goals hammered out, I start to pick out the rewards to go with each goal. This part is a little more tricky. I want to find something that will entice me to work hard without getting in the way of the goal itself. An easy reward is an obvious one – a treat. But a candy bar is not a great reward for a health-related goal because it goes against the whole purpose of the goal. So instead, I select something like adding money to a clothes fund or allow myself to buy a non-food treat like lipstick. If the goal is creativity related, I make the reward creativity related to encouraging me to keep practicing. Lord knows I’m always foaming at the mouth over some new Tombow brush pen or liquid watercolor, and this rewards system lets me channel that lust in an effective way. I will be the first to admit that this is a dangerous game I’m playing. It’s easy for me to be self-indulgent and decide that I deserve a big reward for a small, easily achievable task. I could decide that I deserve a Starbucks coffee for each day I don’t drink soda, but that doesn’t exactly help me reach my goal of drinking less junk. Therefore, I need some checks and balances. This is where my darling husband comes in. Before I ink in my official rewards, I run it by Jon first. He’s tough, so I know he’s not going to let me get ridiculous. Sometimes he’ll tell me that I need to tone down the reward a little bit or I need to set my goal a little higher. If you know someone who you can discuss this with, then chat with them about it! A second opinion works wonders, especially if you are struggling to think of appropriate rewards. And if you don’t want the reward to be tied to money like many of mine are, then don’t! Another precious commodity you can use is time. One reward of mine is an evening of binge-playing video games. I haven’t allowed myself to sit down and play video games in ages because I feel busy all the time. Or if you have a significant other, ask if they would be willing to throw a foot rub your way pending a successful goal. Maybe you can get them to agree to handle a chore, like Jon offered to do with cooking and dishes if I meet my cleaning goal. 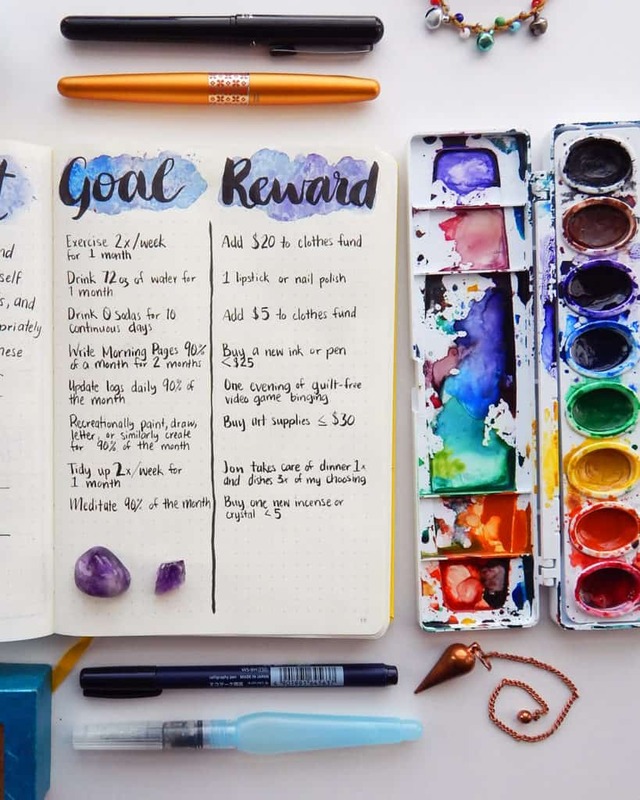 You can surely find rewards that won’t break the bank but will still act as powerful motivators, so don’t bind yourself to a financial goal if it doesn’t feel comfortable. 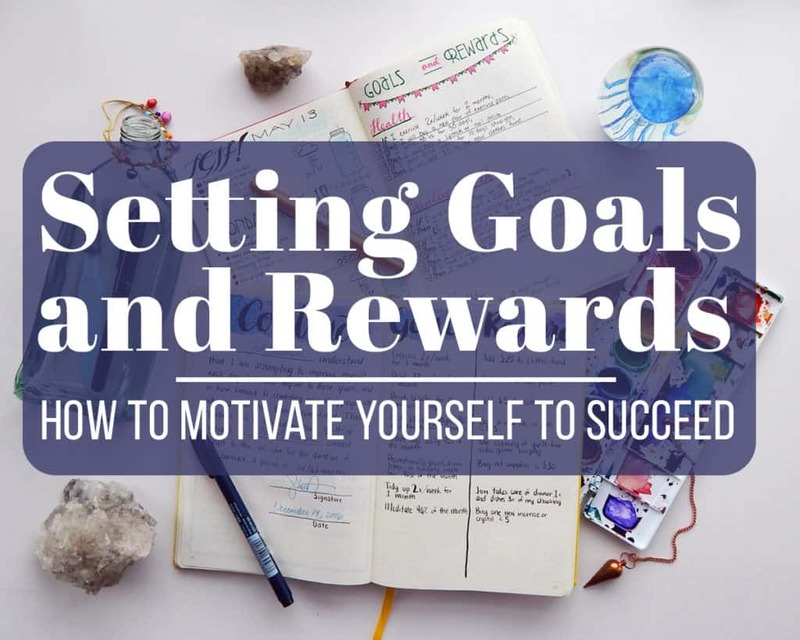 You may have noticed that this is not the first time I’ve written a post about setting goals and rewards. I tried it for the first time back in May of 2016, and I loved it when I first started. The system worked very well for about 3 months. Then my hobby blog transformed into a business blog (want to start your own blog? I got you covered). That meant that rewards like “buy one new accessory for my bullet journal” stopped having any effect since I was buying that kind of stuff all the time for the blog. I couldn’t allow my business’s progress to slow down because I didn’t meet a certain goal, so I stopped adhering to those rewards. I also struggled with the rewards that included adding money to a clothing fund because I never set up a specific place to track that progress. To fix this particular issue, I have decided that I will begin a section in my monthly spreads from now on that includes a progress bar for that type of slow growth. That way I can actively move over the information each month and be reminded of how much I have saved. I can’t wait to start really building a clothes fund, because I would love to update my wardrobe a bit. You’d be amazed at how many articles of clothing I own from high school days. It’s embarrassing. I always feel so energized to hit my targets when I know there’s a reward at the end. I work great if there’s the threat of the stick ( a bad grade, disapproval from a parent, lower income, etc…). But since I don’t have any teachers hawking over me, I have to motivate myself with the carrot instead. I can’t tell you how many times I have come close to giving up on a small daily goal like Morning Pages only to turn it around because of the promise of a reward. That little treat can put a light at the end of the tunnel for tough days. So don’t be afraid to show yourself a little bit of love and set some goals and rewards for yourself. You can accomplish your goals if you have the right attitude, and one attitude you definitely need to succeed is “I deserve good things.” Because you do deserve good things, my friend. You just have to go out there and get them. Read this just in time before I do a konmari kind of purge of all my possessions :p lTakes the pressure off on my goal to simplify, minimize and organize more this year! This will go into my new BuJo. I love it very much. Thank you for the inspiration! Here’s to setting those goals and getting the rewards! Enjoy Natascha. Thanks for these advices (and all the other ones I read but didn’t comment on)… You’re a very nice inspiration, thank you ! Thanks so much for reading Marion! Hey, really useful post! I like how you have a goal set for each little specific task. Also how you decorated the goals list. I needed this. I’ve been stuck- stuck in using my BuJo- stuck in going forward with planning and getting things planned, completed and done. I think this is exactly what I need to do to turn the tables on this slump. Tomorrow is a new day & I will start fresh with setting goals and rewards to go with them to help motivate me to move forward. Thanks for the encouragement. I’ve done this before – but didn’t think about it again until I read your post. couple of hours each day. Next I’ll move on to your goals and rewards, thinking of a nice massage as a reward. That sounds like a wonderful reward to me. Enjoy! I just want to say that your blog and instagram have been a great source of inspiration to me. I started bullet journaling pretty recently and now I’m teaching myself to watercolor. I’m going to implement this reward system like right now. It’s so hard to get motivated sometimes, but I think this will make it much easier! Thanks for the post! I’m thrilled to hear that, Jessicam! This rewards system has been so helpful to me, and I’m sure you will find it is the same for you. I hope you have fun setting new goals and hitting them! I love these beautiful pictures! Rewards really help me reach my goals. Except I have a problem with giving myself two days worth of unhealthy eating for my five days of eating better lol. 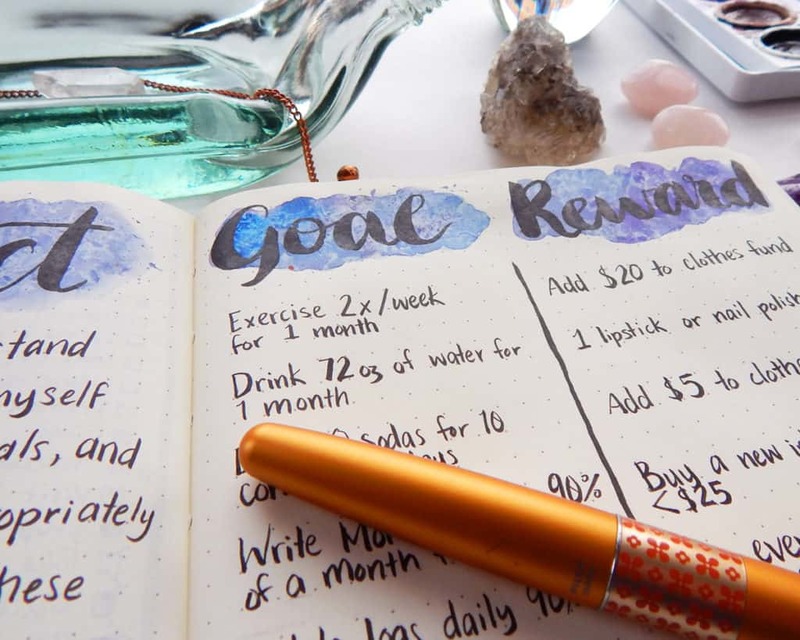 I also like the idea of writing down our goals and rewards next to each other. A couple years ago I made a photo frame craft to write down my bucket-list goals. It’s not as pretty as yours, but here it is https://www.passionbrewingmomma.com/diy-bucket-list-photo-frame-craft/. That’s lovely! It’s great to have your goals out and visible all the time. That’s one of the downsides to keeping everything in a journal – you have to flip to it to see it! I was looking for a new method of goal setting. I’m going to introduce Goals & Rewards to a group of extraordinary women that I meet with. I believe it will be a hit. Thank you. I’m so glad you enjoy the method, Beatrice! And I sincerely hope that the ladies you meet with find it as helpful as I do. I work harder for a new tube of lipstick than is probably dignified, but what can a girl do :lol:? I continuously struggle with goals and motivation. I am super with helping someone else,but wow!not on mine. Here’s to hoping you have helped me yet again. As always,you inspire! Thank you so much, Ellen! Sometimes it’s hard to take your own advice and you just need someone else to say it to you. I hope you rock your goals and find that awesome motivation!